World No. 2 Roger Federer strolled into the second round of Australian Open by defeating French Benoit Paire 6-2, 6-4, 6-1 in the first round. 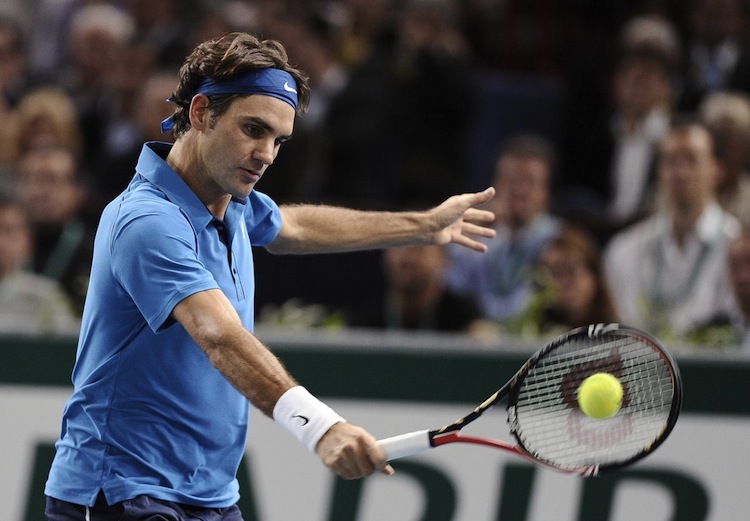 It was Federer’s first match of the season as he decided not to participate in any tournament before the Open. He is aiming to become the first player in Open Era to win five Australian Open titles. Seventh seed Jo Wilfried Tsonga also won his first round clash against compatriot Michael Llodra in straight sets 6-4, 7-5, 6-2. It was his sixth win over Llodra. Philipp Kohlschreiber defeated Steve Darcis 6-2, 6-3, 6-4 and plays qualifier Amir Weintraub next. Weintraub won his first round match beating Argentine Guido Pella 7-6(2), 7-5, 6-2. World No. 3 Andy Murray showed little nerves to defeat Dutch Robin Haase 6-3, 6-1, 6-3 on Rod Laver Arena. He next faces Joao Sousa who defeated wild card John Patrick Smith 6-4, 6-1, 6-4. Canadian Milos Raonic lost the first set but eventually prevailed in four sets against Jan Hajek 3-6, 6-1, 6-2, 7-6(0). Germany’s Florian Mayer came back from two sets down and saved two match points to win 2-6, 3-6, 6-2, 7-6(12), 6-1 over wild card Rhyne Williams. Upset of the day was done by Blaz Kavcic who knocked out 29th seed Thomaz Bellucci of Brasil 6-3, 6-1, 6-3. Sixth seed Juan Martin del Potro defeated Adrian Mannarino 6-1, 6-2, 6-2. Marin Cilic defeated home hope Marinko Matosevic in a tough match 6-4, 7-5, 6-2. Frenchman Gilles Simon defeated Italy’s Filippo Volandri 2-6, 6-3, 6-2, 6-2 after losing first set. He will next face Canadian Jesse Levine who upset Spain’s Tommy Robredo 7-6(5), 6-7(2), 6-4, 6-4. Australian No 1 Bernard Tomic who reached fourth round last year defeated Argentine Leonardo Mayer 6-3, 6-2, 6-3. Tomic has won the Sydney Open last week which was his first ATP World tour title.